When Rahul Bheke of Bangalore scored late into extra time, he broke the hearts of tens of thousands of Goans here, those in the stadium and yes even those living around the world. This was the second time Goa was being defeated by goals scored very late in extra time. 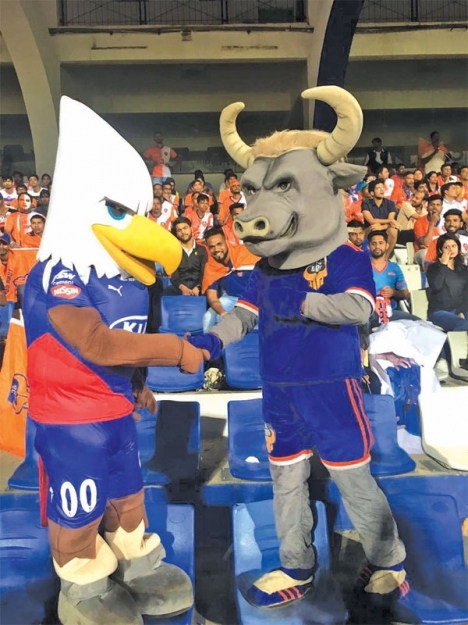 When FC Goa qualified for the finals by the virtue of 5-2 win over Mumbai, there was sheer happiness in Goa as many felt this was an opportunity for the team to right the wrong. To encourage the team, hordes of fans travelled by bus, flight, road to be present in Mumbai for the finals. According to Conrad Barretto who travelled from Goa with several others there were approximately 3000-4000 fans from Goa, around a thousand from Bengaluru in a stadium that seated 7500. Conrad said the support for the team from its supporters was noisy and wholehearted but it was a case of sheer bad luck. He said “It was a crazy goal. We played well but we did not create chances. We have more possession but we could not do much with it. I have hope for the next season. If this tournament was conducted on a league format, we would have won on goal difference”. He along with friends watched the prize distribution ceremony and left the same night for Goa. For Skitter Faia who has followed the progress of the team closely for a couple of seasons it has been rather tough. She said It was heartbreak for sure to know that the team was not able to lift the trophy this year despite a great run through the season. However, I choose not to grieve over the loss but instead to celebrate the achievement of team FC Goa who made it to the finals and all the people behind the scene who worked diligently through the season. The club has a phenomenal coach leading the boys on the field and we appreciate every effort made by the team. FC Goa has captured the imagination of the people of Goa. Three cheers to the team. We look forward to another fantastic season”. For Akio Fernandes, it was a night of disappointment. According to him, the team played quite well but in the larger picture, it was ok because they lost to a goal scored in the 117th minute. The injury to Mandar and the red card did not help matters, he felt. It was just not meant to be. He however expressed his confidence of a better performance next year and with some smart selection they would be able to go the whole hog. He said “Please remember Bengaluru went to the AFC, I league and they had a better all-round team. Our time will come”. Niyaz is a part of the club fan club and who was present at the finalssaid it was an amazing experience being present at the stadium. With Mandar (Desai) out the balance of the team was not right. I have to concede the goal was very good. Our goalkeeper and the defence were very good right through the match but goals like that happen”. Speaking about the next season, he felt it would all come down to the balance in the squad. Like any sport, it is always about the enthusiasm shown by the very young towards the team that enthuses the squad. Kian all of 10 has been following FC Goa with great enthusiasm. He managed to watch all the games on TV and watched the finals too with his family on television at home. He said it was heart-breaking to lose considering the team had played so well. The goal he felt was a fluke because Rahul never ever scored. Next season, he hoped to be in the stadium urging the team forward and this he hoped would be helped by free tickets. Good players would certainly help too. The hopes of an average Goemkar looking for glory through football still lives on and he lives to fight another day. For the sake of little Kian Manuel and his friends and thousands of parents living their own dreams as those of their children, the curse of extra time goal in the finals has to be over.